The center roof section pops up on the Mantis, a travel trailer from Taxa Outdoors. 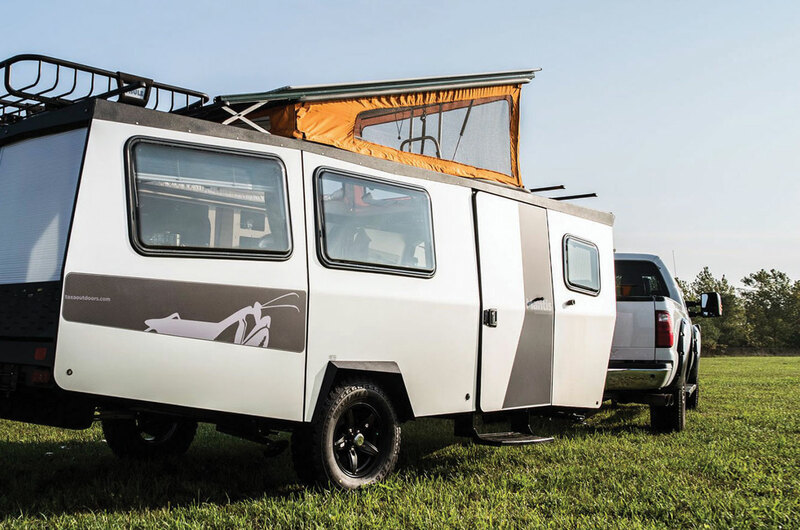 Taxa Outdoors Inc.’s newest travel trailer is the 18-foot Mantis. The RV sleeps up to four adults and weighs 2,800 pounds (unloaded). The trailer folds down to a height of 6 feet 9 inches so that it can be stored in a garage of standard length and height. It comes with 30-inch, all-terrain tires. The RV’s center roof section pops up to allow standing room in the kitchen and bathroom areas. The Mantis has a queen-size bed made from vinyl memory-foam cushions that can be converted to a couch, as well as two adult-sized bunk beds. The Mantis is available in a Camp model, which runs on two 12-volt deep-cycle batteries or on shore power. A Trek model is outfitted for propane, which can be used for the two-burner stove, water heater, and refrigerator, with an optional Truma Combi furnace. Air conditioning is optional for both models. For more information, visit www.taxaoutdoors.com. Jeannine Patané is the founder of an RV rally management and promotional service called RV Compass. She sees plenty of evidence of the growing number of full-time RVers. She’s one herself, journeying solo in her 13-foot travel trailer. She has pointed out that no one has established just how many people are full-timing. Having such a number, she said, potentially could provide leverage to benefit the RV community. And so Ms. Patané is in the midst of a yearlong study that she said she hopes will not only provide numbers but also shed light on how, why, and where people choose to pursue the full-time RV lifestyle. She asks full-timers to fill out an online questionnaire at www.rvcompass.com/fulltime.html. The survey will be available through 2018. Dometic has introduced its Signature Kitchen Suite. According to company officials, the matching suite of appliances is an industry first. The suite includes the newly redesigned 6-foot or 8-foot Americana or Americana Plus refrigerator; either the new two-burner drop-in cooktop or the three-burner slide-in cooktop; the three-burner range, either 17 inches or 21 inches; a range hood; and a microwave oven. Meanwhile, to get to know consumers better, this past winter Dometic sent its research team, product managers, and its corporate marketing team from Sweden to Quartzsite, Arizona, where they spent a weekend boondocking with thousands of RVers. The purpose was to glean information about how RVers use Dometic products and to generate new ideas. Chinook Motorcoach, which manufactures Type B motorhomes in Elkhart, Indiana, announced in February it would acquire certain assets of Vohne Liche Manufacturing, a builder of towable RVs. The deal was still being finalized in early March. Von Liche, based in Peru, Indiana, operated until 2017 as Riverside Travel Trailers, according to RVBusiness.com. The company produces Dream and Riverside travel trailers, as well as the RPM toy hauler. Phil Rizzio bought the Chinook brand in 2013, resurrecting a company that had been closed since 2005. With the new acquisition, Chinook will operate in 170,000 square feet of manufacturing space. For information about Chinook, visit www.chinookrv.com. Ford’s F-150 pickup now can be equipped with a diesel engine capable of towing 11,400 pounds. Ford has introduced a new engine for its F-150 pickup truck line — a 3.0-liter, 250-horsepower V-6 Power Stroke diesel. It is capable of towing 11,400 pounds or hauling 2,020 pounds. The engine produces 440 pound-feet of torque. The truck has an EPA-estimated rating of 30 mpg on the highway. 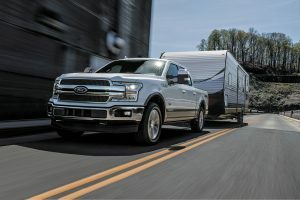 The 3.0-liter Power Stroke engine is the sixth engine choice for F-150 customers. The engine is available for 4×2 and 4×4 pickups. For the 2018 camping season, Cedar Point amusement park in Sandusky, Ohio, is adding 25 new “ultimate RV sites” to property along Lake Erie formerly occupied by a hotel. Each of the new full-hookup sites will feature amenities not offered at the park’s standard RV sites. They include a private patio area with enhanced landscaping; a dining table with chairs; a built-in charcoal grill; a wood-burning fire pit; and Adirondack chairs. Four of the sites will include a glider swing with views of Lake Erie. A new rest room facility and bathhouse will open adjacent to the expansion. The 25 new sites bring the total RV spaces to 120, according to Cleveland.com. For more information, visit www.cedarpoint.com/stay/lighthouse-point. You may be noticing Go RVing — the RV industry’s national advertising and marketing campaign — popping up at more events and venues. It’s the result of a two-year partnership between the Go RVing Coalition and Learfield, a sports marketing company. The Go RVing Coalition consists of RV manufacturers, component suppliers, dealers, and campgrounds. Among the events where the Go RVing brand has been or will be featured are college basketball radio and television coverage, the NCAA’s “Suits and Sneakers” program, a country music national campus tour, and college tailgating. RVIA Today Express reported that the agreement includes radio ads on 935 affiliates covering 108 schools. Go RVing was the title sponsor on games for eight different schools this past basketball season. Go RVing courtside signage was displayed during University of Kentucky games, as well as at conference tournaments for the Atlantic 10, Big Sky, Big West, Missouri Valley, Mountain West, Patriot League, and Southland conferences. Other scheduled events included the University of Alabama’s spring football game and seven country music concerts, among them a concert series at the University of Iowa and the Carolina Country Music Festival. Go RVing, which was created 20 years ago, has delivered the RV message through magazines and TV shows, online, and at special events. Kaibab Camper Village, a private campground near the North Rim of the Grand Canyon, has new owners, and as a result, RVers now can check campsite availability and make reservations online. Kaibab’s 98 campsites includes nearly five dozen RV sites, most of which have 30-amp electrical connections. Water and sewer service also are available, as are a coin-operated laundry, shower facilities, and a camp store. Chris and Ellen Winchester purchased Kaibab Camper Village in January 2018. They have owned and operated Kaibab Lodge since 2004. The campground, located at an elevation of nearly 8,000 feet, is open from May 14 to October 14. For more information, visit www.kaibabcampervillage.com.